In theory, I could tell you what makes a latte different from a cappuccino and what makes them both different from a flat white, but life is short and when it comes down to it, it’s all a matter of taste. Despite what I’ve said about espresso and cafetiere coffee, I actually drink a lot of flat whites/lattes when I’m out, this one from the Boston Tea Party being a good example. The key to all of the variations is that they start with an espresso coffee to which various combinations of steamed and frothed milk are added. Another alternative is café au lait. (I’m talking here about the European definition which is a mix of espresso coffee and steamed milk; I’m aware that café au lait means something else in America, usually a filter coffee topped with steamed milk). Sometimes the milk and coffee are served together, but the proper way to do it is to serve a pot of coffee and a pot of milk, allowing you to mix the quantities as you see fit (I like it 50-50). If I’m out and not in the mood for an espresso, then I’ll usually plump for a flat white, or if that’s not an option, a latte. However, in the rare instances where I have the option of a cafetiere of coffee, I’ll usually take that instead. That said, there are times when what I actually want is a café au lait, which I make for myself at home, usually to go with a baguette and croissant for breakfast or with Italian bread at lunchtime. Different coffees for different moods. 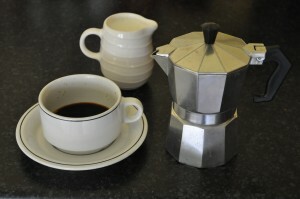 Talking of café au lait, it’s worth mentioning the stove-top espresso machine (see picture). I’d never use one to make an espresso; you can never get either a good crema or get the drink short enough. However, it makes an excellent base for a café au lait. It’s also worth talking about how you heat the milk; traditionally you should steam it, but I’ve yet to find a domestic espresso machine under £500 that reliably steams milk (and am sufficiently poor that I can’t justify spending more than £500 on one), so I generally just heat mine on the stove. So, what makes a good latte/cappucino/flat white/café au lait? Well, obviously, there are two elements: the coffee and the milk. One of the reasons I prefer a cafetiere of coffee is that with the latte/cappucino/flat white/café au lait, it’s much more about the milk. The coffee can often get lost (although in the best examples, particularly with a good flat white, where the milk content is less, it doesn’t). It’s also much easier to disguise poor coffee by drowning it in milk, although really poor coffee will stand out (since you then feel like you’re drinking warm milk on its own). For a really good drink, the milk needs to be right. It should be rich, with a good body and volume (another area where steamed milk scores over warmed milk). If you get it wrong, you end up with a rather milky coffee, which is just disappointing. You also need to have the milk at the correct temperature. Too hot and you get scalded, too cool and it just doesn’t taste right. So, when you consider all the effort that goes into making one of these things and how much can actually go wrong, perhaps you can see why I prefer the simplicity of a cafetiere when I get the chance? Back to the Coffee Page. I’m forever trying to recapture the taste of the flat whites I had in New Zealand in 2007, but the ones I’ve tried here are too often like frothy warm milk. NZ was one place I’ve been where you could consistently get great coffee in the most unlikely out-of-the-way places. It certainly falls short of that where I live in south Hampshire! I can believe that! How does Southsea Coffee’s flat white shape up? 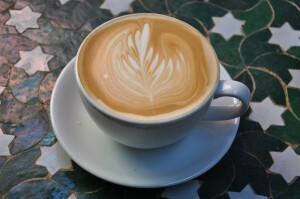 Talking of which, have you been up to London and visited Flat White (http://www.flatwhitecafe.com/)? If you can’t get a flat white that meets your expectations there, I don’t hold out much hope! SCC’s was pretty good as I recall…and no, I’ve not visited Flat White but I will now! Brian i can recommend the Gaggia Classic for making a perfect Flat white. They cost about £350 in uk. I bought mine in australia about 6 years ago where I owned a coffee shop and learnt how to make flat whites. Perfect for firdt coffee of the fay at home. Interesting… I’ve never been able to steam milk well using a single-boiler machine. I’d always assumed it was the boiler; maybe it’s my technique that’s been faulty all along!